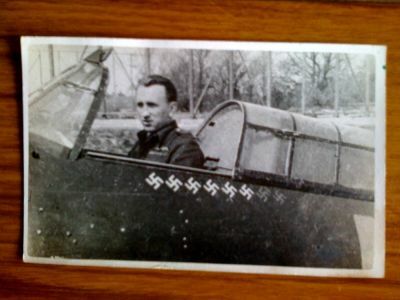 In 1985, my biography of Vee’s father – Flight Lieutenant Karel Kuttelwascher DFC & Bar – was published as “Night Hawk”. It took me three years to research and write and I thought that the project was then over – but it keeps coming back to life, even after 26 years. In 2006, Vee and I were interviewed for a television programme about her father’s wartime exploits in a series called “Love And War”. From time to time, it is rebroadcast by the Yesterday channel. At the beginning of May, the programme was broadcast again. One of those who saw it contacted his daughter who then tracked me down. Don (‘Lofty’) Parks – who is 90 in a few weeks time – was a flight mechanic who worked on Kuttelwascher’s Hurricane IIC aircraft and remembers him well. 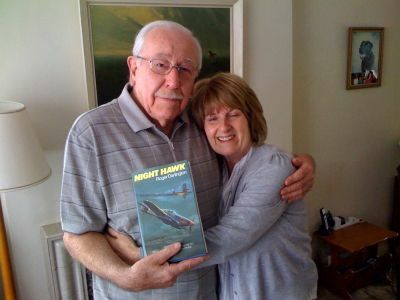 His daughter Gillian Castro was keen to obtain a copy of “Night Hawk” for her father for his 90th birthday but, of course, it has long been out of print and only second-hand copies are available online. So this afternoon we drove over to meet Don and Gillian in St Albans and Vee presented him with a signed copy of the book from our very limited stock. As you can imagine he was absolutely thrilled. Don is in incredibly good shape. He still lives alone and does all his own cooking. Each morning, he does a set of exercises that he learned while in the wartime Royal Air Force. We spent over two hours listening to his wartime reminiscences. He was a member of the ground crew at No 1 Squadron throughout the three-month period when Vee’s father shot down 15 German bombers. He later served in Egypt, Palestine and India. Vee and I have never seen a decent photograph of her father in his Hurricane fighter aircraft but Don has one which he is copying for us. This entry was posted on Sunday, May 29th, 2011 at 10:43 pm and is filed under History. You can follow any responses to this entry through the RSS 2.0 feed. You can leave a response, or trackback from your own site. Absolutely fascinating story and Don Parks looks great, I will be eternally grateful for the career chance he gave me at Rolls- Royce Leavesden. He only looks 75 at the most! !